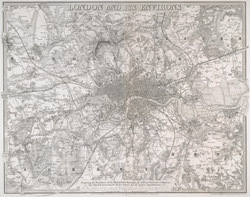 This is a later edition of the map of London and the suburbs first issued by Davies in 1840. The map features title in top border, scale bar at bottom centre and key to symbols below the map. A note below the map states that the map contains "the boundaries of the Metropolitan Boroughs, the different railroads and stations, the new cemeteries and roads, docks, canals and all the modern improvements". The map is chiefly drawn from the Ordnance Survey, the railroads and the other improvements from the official copies and the Borough of Marylebone from the survey published by Mr Britton. The whole corrected from personal observations and measurements."